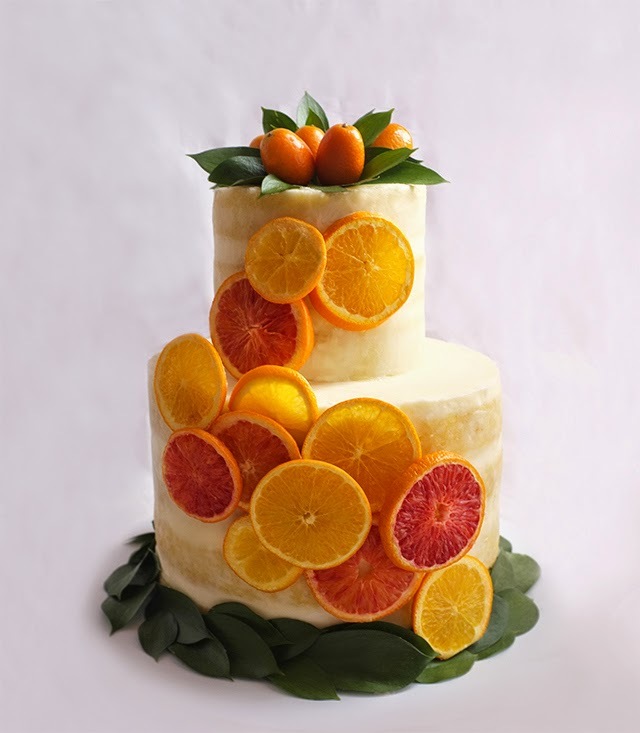 This is just one of an abundance of culinary creations from the website of Alana Jones-Mann. 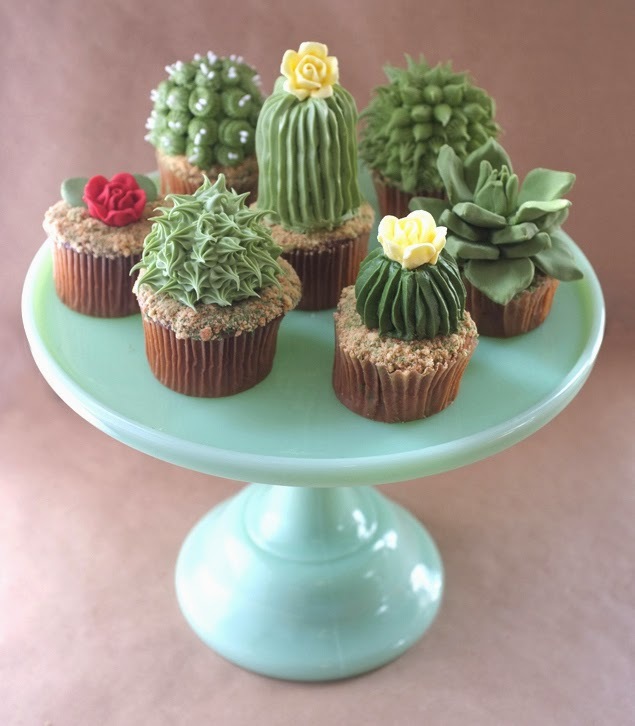 Details about how to craft these cupcakes in this tutorial. (embedded image cropped for size). The Fantastic Flying Books of Mr. Morris Lessmore is a 2011 animated short film... 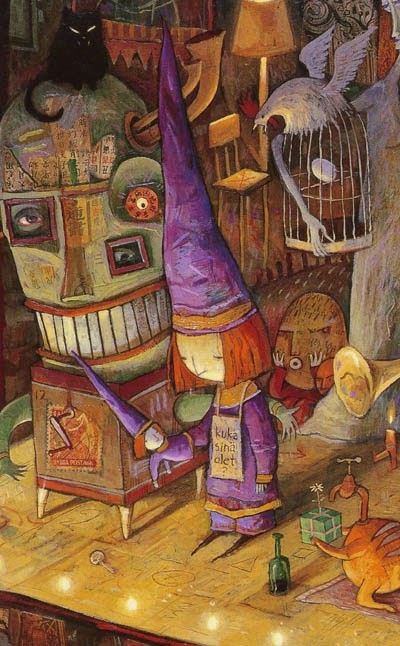 Described as an "allegory about the curative powers of story," the film centers around bibliophile Lessmore and his custodianship of a magical library of flying books. 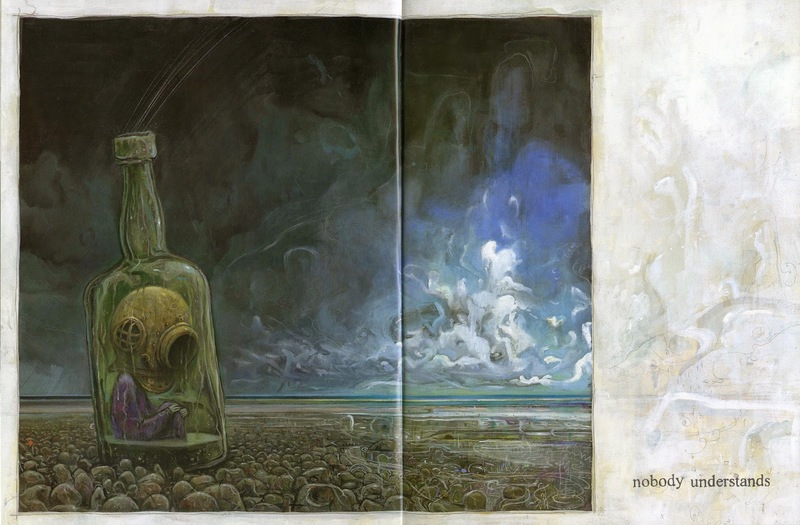 It was created using computer animation, miniatures and traditional hand-drawn techniques. After winning over a dozen film festivals, the film was awarded the Best Animated Short Film at the 84th Academy Awards. 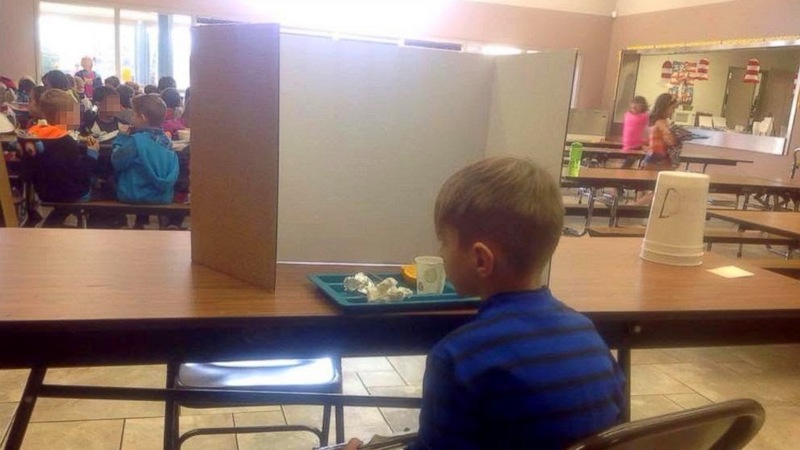 Photo taken by his mother, who was called to pick him up from school because he wouldn't stop crying. Garloff and Cmelo spoke exclusively Wednesday night to NewsWatch 12’s Erin Maxson to explain why their son is tardy so often. According to the couple, riding the bus is not an option because the family lives within a mile of Lincoln Elementary. Hunter’s dad Mark says walking is not an option because the roads are too busy for someone his age. Hours after Mark leaves for work Nicole says she gets her son, three year old daughter and herself in the car. This, she says, can be delayed for a number of reasons. Sometimes Hunter isn’t ready, but most often the tardiness is not his fault. Nicole suffers from osteoporosis which makes it painful and difficult for her to function, especially in the morning. She said that is usually why they are late, but added that in January the tardiness increased because the family was also having trouble Nicole’s car starting regularly. Absence from school is an undeniable problem. We know it is correlated with lower grades, with dropping out of high school, and with trouble with the law. What is less certain is if treating truancy as a crime addresses these underlying issues in an effective and reasonable way. Such interventions have not been proven to increase school attendance or decrease long-term criminal behavior. In fact, the criminalization of truancy often pushes students further away from school, and their families deeper into poverty. Lots more at the link. 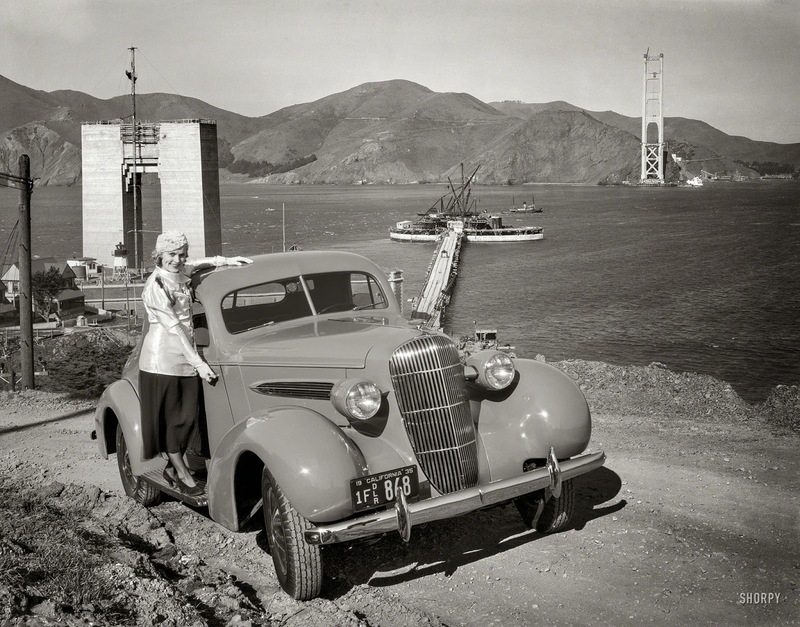 A photo from 1935, found at Shorpy (click to embiggen). "The Lost Thing" won the 2010 Academy Award for Best Animated Short Film. 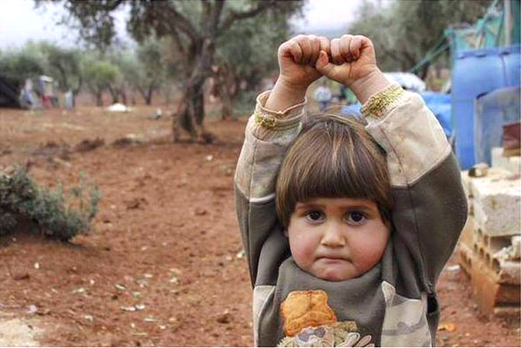 Thinking the photographer's camera was a gun, the four-year-old child "surrendered." Details here, discussed at Reddit. Memory becomes like a flickering signal from a faraway shortwave radio station: people can do and say things, then promptly forget them, and then do and say them again. They can no longer read obvious social cues. They become easily distressed as a thickening fog descends upon them, causing them to lose track of everything. As the disease progresses, only fleeting glimpses of the once capable person can be seen; for the rest of the time, everyone is stuck with an uninvited guest. Eventually, the sufferer fails to recognise even loved ones. People with dementia need environments that are constant and reliable, and so require little new learning. Living with such people entails embracing the pleasures of patient repetition rather than constant novelty. Explained (in a little too much detail) by a shipwright in terms relevant to boat building, but the principles illustrated would be of interest to anyone who works with wood. 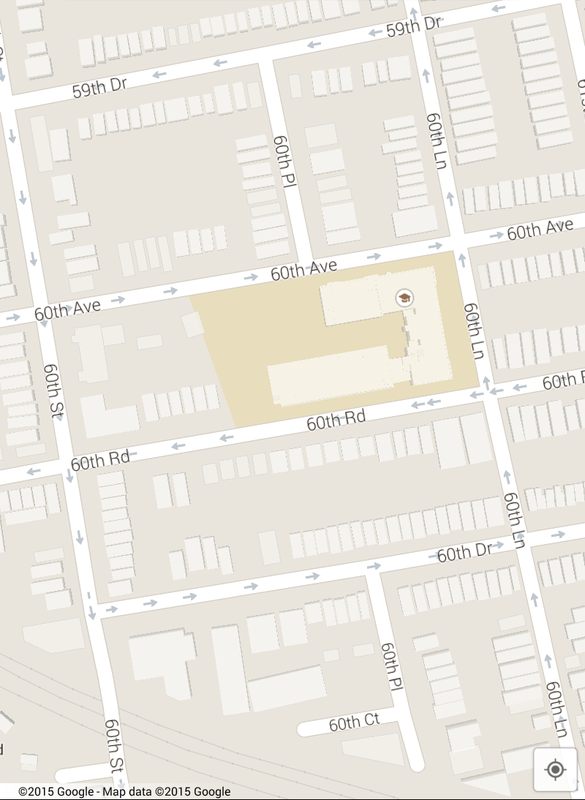 If you are in Queens, NY, you have a multitude of choices - 9 intersections and 28 corners by my count. Image cropped for size from the original at The Land of Maps. 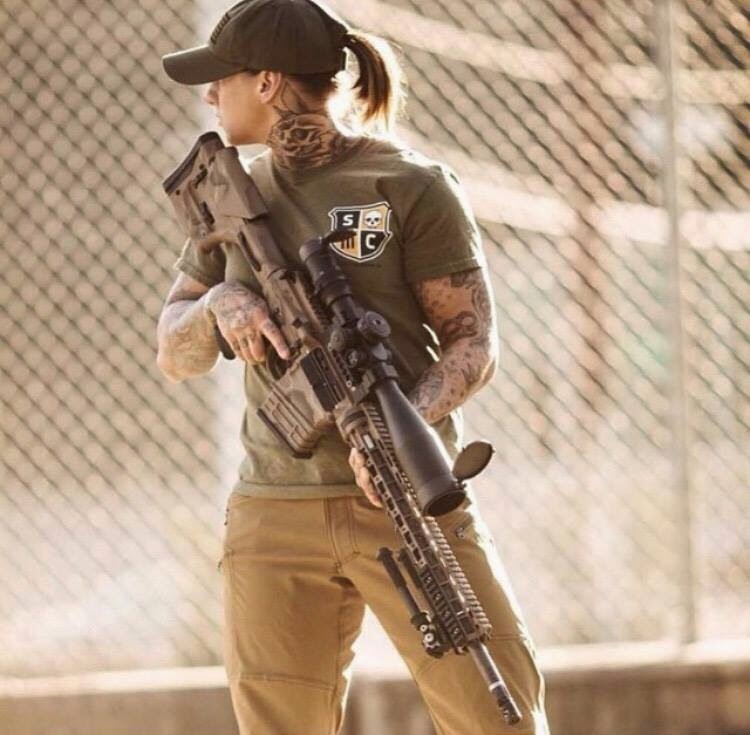 The photo is of Kinessa Johnson, an "anti-poaching" advisor. Here are the links to her Instagram posts and her Facebook page. Kinessa works for VETPAW - "Veterans Employed To Protect African Wildlife." VETPAW provides meaningful employment to post-9/11 veterans, utilizing their expertise to train and support Africa’s anti-poaching rangers to prevent the extermination of keystone African wildlife, and the disastrous economic and environmental impact it would have. I think you're slightly missing the point of paramilitary operations to save wildlife. Paramilitary operators do not go out with the intent to kill anyone that breaks laws, they go out with the intent of securing a location by use of a military structure and strategy, which means they cover more ground and are more effective in covering large areas of operation. I run into this issue all the time because many think my organization (VETPAW) is just a bunch of American war mongering gunslingers coming to throw lead down range and shoot poachers in the face. In fact that's the complete opposite of what we provide- my team has spent so much time in war zones that they are the last to crack under pressure and pull the trigger. ..
Kinessa has done an AMA on Reddit. The weapon in the photo, btw is a SI Defense 300WM PETRA Rifle. Owing to its long-standing prominence in world culture, we find enough archaeological data exist for the violin and its ancestors to quantitatively trace design traits affecting radiated acoustic power at air cavity resonance across many centuries of previously unexplained change. 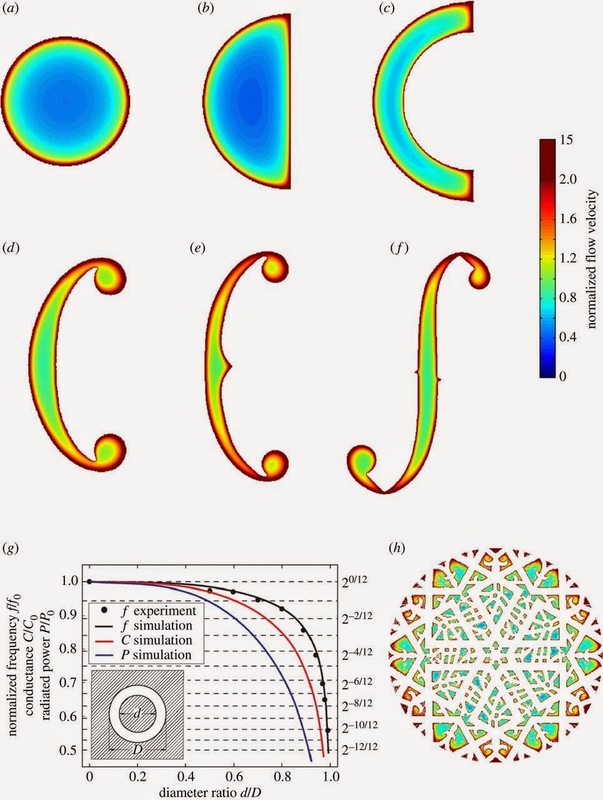 By combining archaeological data with physical analysis, it is found that as sound hole geometry of the violin's ancestors slowly evolved over a period of centuries from simple circular openings of tenth century medieval fitheles to complex f-holes that characterize classical seventeenth–eighteenth century Cremonese violins of the Baroque period, the ratio of inefficient, acoustically inactive to total sound hole area was decimated, making air resonance power efficiency roughly double. The corresponding evolution rates are found to be consistent with (a) instrument-to-instrument mutations arising within the range of accidental replication fluctuations from craftsmanship limitations and subsequent selection favouring instruments with higher air-resonance power, rather than (b) drastic preconceived design changes from instrument-to-instrument that went beyond errors expected from craftsmanship limitations. Lots more at the primary link, and in an article in The Economist, via BoingBoing. Those who found the image of the captive fennec fox disturbing should enjoy this video of a fennec fox interacting with two little girls on his home turf, so to speak. A hat tip to reader Ellen S. for locating the video. Its name comes from the Arabic word فنك (fanak), which means fox, and the species name zerda comes from the Greek word xeros which means dry, referring to the fox's habitat. To be more precise, the merely rich are losing influence to the super-rich. We should clarify that the "bundlers" are not necessarily millionaires, but that millionaires are encountering the same problem. Other bundlers, on the left and the right, are turning their attention to congressional races, where they can get more personal attention. A Stanford University mathematician explains some of the nuances of shuffling playing cards. Most of it is standard math (7 shuffles adequate, more superfluous), but the comment that "smushing" (1:00 in the video) works quickly and effectively was new to me. As a person born with a prominent birthmark, I've always been interested in how other people handle theirs. 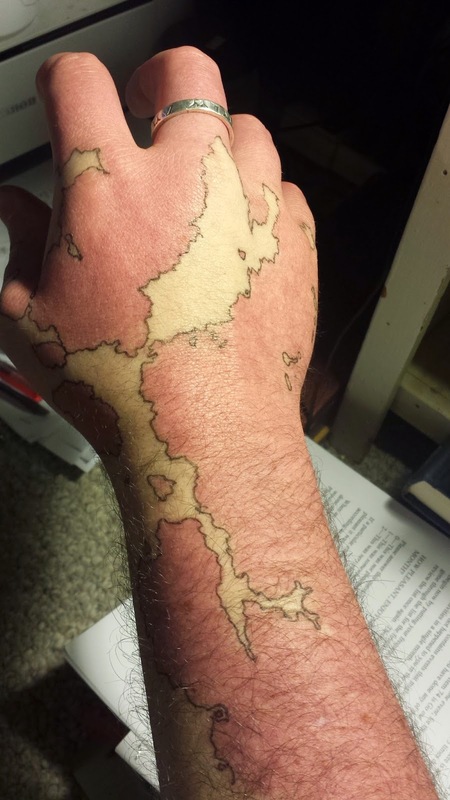 This man accepted his ?vitiligo, and with the addition of some judiciously-placed pen ink, converted it into a map. As Bloomberg points out, Texas Attorney General Ken Paxton has argued that selling the data would be illegal under state law. 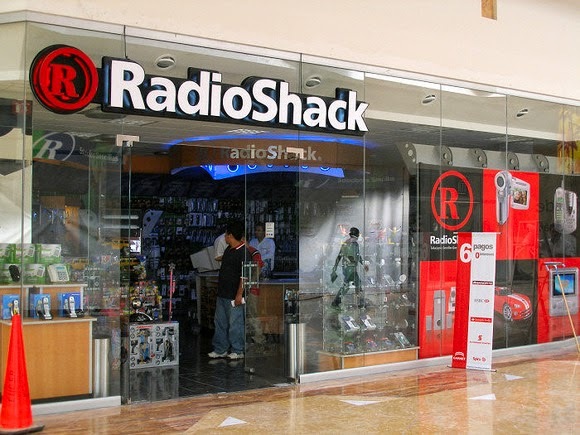 Texas doesn’t allow companies to sell personal information in a way the violates their own privacy policies, and signage in RadioShack stores claims that “We pride ourselves on not selling our private mailing list.” Paxton believes that a data sale would affect 117 million people. 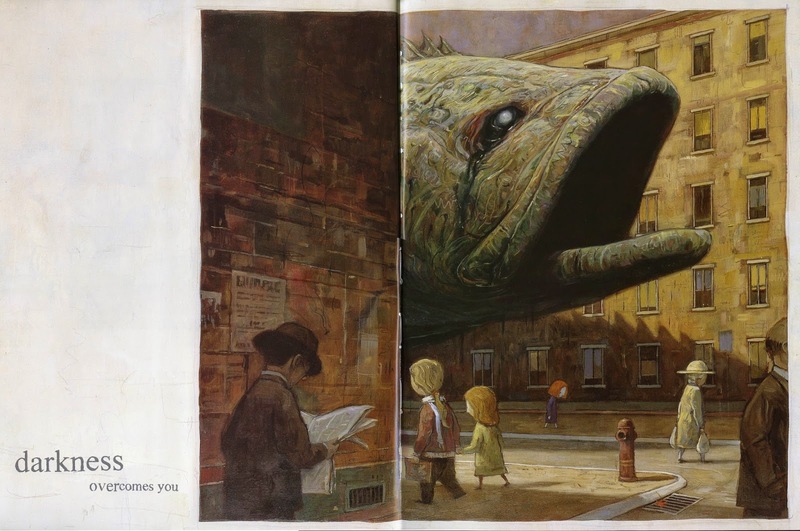 I found this visually interesting book by Shaun Tan (Simply Read Books, 2002, ISBN 0968876838) in our library. You can also view the contents at the equally-interesting Poemas del Rio Wang. Over the past five years I've written three posts about credit card skimmers. In 2009 an alert to the existence of skimmers that steal your credit card data at ATMs. In 2010, photos of some virtually undetectable skimmers. Then in 2011 reports of skimmers found inside hacked gasoline pumps. This year's report comes from Krebs On Security, which reminds us that security tape on a card-accepting device (gas pump for example) is meaningless. 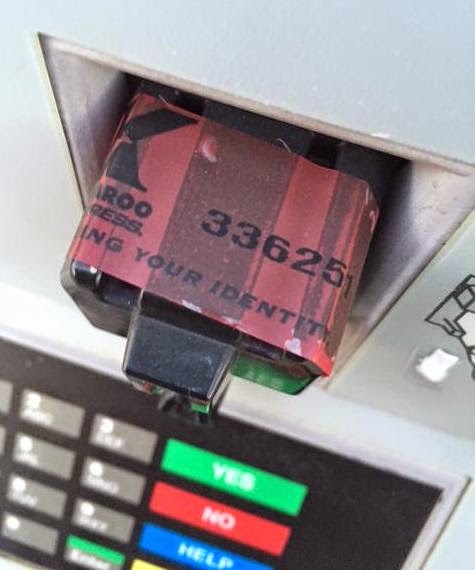 Of course, security tape wrapped around a card reader at a gas pump isn’t going to stop most pump skimming attacks, which start when someone with a master key for the pump opens it up and fiddles with the guts of the machine. The crooks figured out a long time ago that only a handful of master keys are needed to open the majority of the gas pumps in use today. I heard excerpts from this first movement last week while watching an old movie ("Now Voyager") and thought it deserves a place in the blog. The second theme of the first movement formed the basis of a popular song in the 1940s, "(This is) The Story of a Starry Night" (by Mann Curtis, Al Hoffman and Jerry Livingston) which was popularized by Glenn Miller. This same theme is the music behind "Where," a 1959 hit for Tony Williams and the Platters as well as "In Time," by Steve Lawrence in 1961, and John O'Dreams by Bill Caddick. All four songs have completely different lyrics. Excerpts from Tchaikovsky's Sixth can heard in a number of films, including Now, Voyager, the 1997 version of Anna Karenina, The Ruling Class, Minority Report, Sweet Bird of Youth, Soylent Green and The Aviator. It has also accompanied the cartoon The Ren & Stimpy Show, specifically the episode 'Son of Stimpy' where the eponymous cat walks out into a blizzard. In addition, Tchaikovsky's Sixth is featured in the sci-fi video game Destiny, during the mission The Last Warmind, in which the player must defend Rasputin, an old planetary defense system. Tchaikovsky's Sixth Symphony has also been featured during the 2010 Winter Olympics closing ceremony, being danced by Russia's national ballet company. Tchaikovsky's Sixth plays a major role in E. M. Forster's novel Maurice, where it serves as a veiled reference to homosexuality. 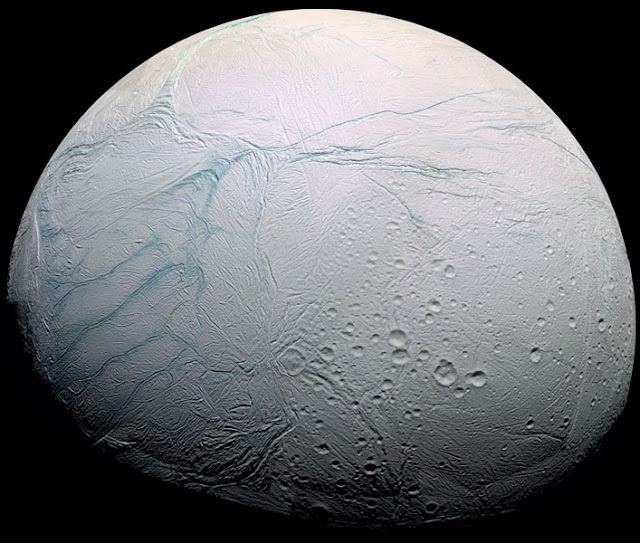 "We've known from quite early on that Enceladus was the source of the material in Saturn's [outermost] ring… based on the ring's composition" Hsu says, "although we didn't know the exact mechanism for the material transfer." But the 2005 discovery of 125-mile-high icy geysers shouted out to scientists how Enceladus flung material skyward. Hsu and his team analyzed a class of dust nanoparticles in this outermost ring. Using Cassini's mass spectrometer tool, they showed that these dust particles were made mostly of silica, and that they were the skeletons of evaporated geyser-flung saltwater. These particles point toward warm waters on Enceladus. It just amazes me that we are now capable of studying nanoparticles in the rings of Saturn. More at the link about the strange "war" between the company and those working the black market. 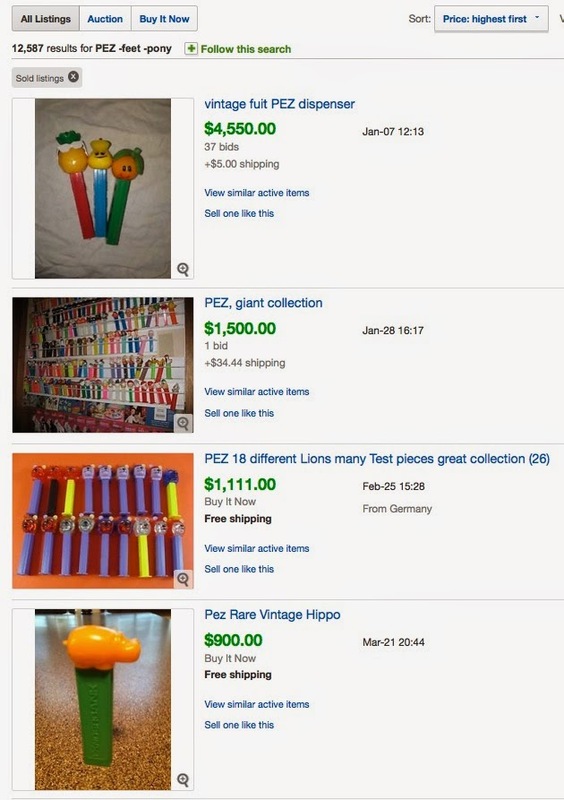 The embedded image is a screencap I took of recent eBay listings. Note these are completed sales, not asking prices. I thought the fad had died out ages ago, didn't know it was still a thing. 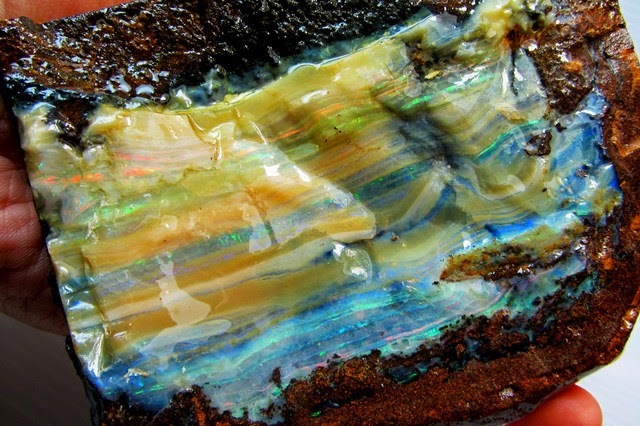 "Boulder opal consists of concretions and fracture fillings in a dark siliceous ironstone matrix. It is found sporadically in western Queensland." Via the Minerals Minerals Minerals! tumblr. A series of videos entitled "No Small Parts" presents biographies of those actors whose faces you recognize but who have never achieved "star" status. Having a bad day? Imagine living this young woman's life. For those who prefer text, an introduction to the life of Lizzie Velasquez (5'2", 60#) is in the Washington Post. Throughout her life, her condition has made her a target for bullies, who once dubbed her the “world’s ugliest woman” on social media... Velasquez is a motivational speaker who uses her experiences to fight bullying. A "chugger" is a portmanteau term for a "charity mugger." NASA now reports that not only did Mars once have water, but that there was probably a vast ocean covering a fifth of the planet. Prenatal genetic testing of a fetus sometimes reveals information that the mother has cancer: "...scientists from Sequenom said they have seen more than 40 cases in which the test revealed an abnormal genetic profile suggestive of cancer in the mother. At least 26 of these women were subsequently confirmed to have cancer... If she has cancer, then tumor cells may leak their DNA — lousy with chromosomal defects — into the bloodstream..."
Photos of a snow-covered bald eagle brooding her eggs. Nestlé will only have to pay the Canadian government less than $600 per year for the use of 265,000,000 liters of groundwater. The bird collection of Oslo's Natural History Museum is now available online. The term "worry wart" became popular as the result of being used in a comic strip. "... it didn’t mean what it does now — somebody who constantly worries about everything and anything. 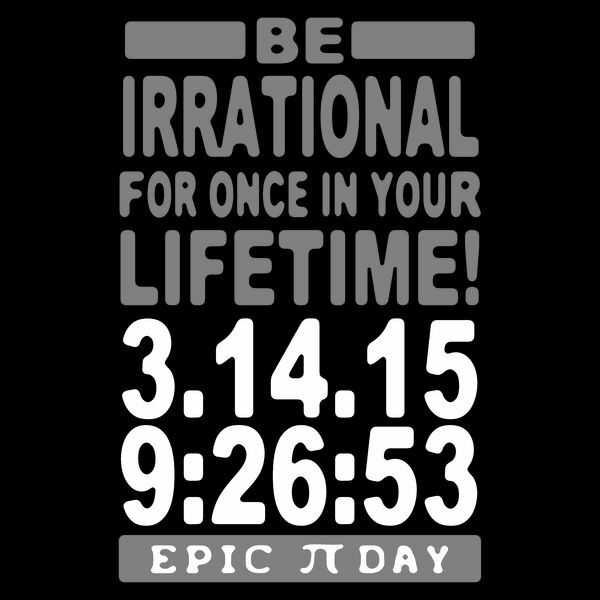 Instead it took its sense from the cartoon — a child who annoys everyone through being a pest or nuisance." "Vog" is a combination of fog, smog, and volcanic gas. Lindsey Graham has never sent an email. Florida Department of Environmental Protection officials "have been ordered not to use the term “climate change” or “global warming” in any official communications, emails, or reports, according to former DEP employees, consultants, volunteers and records obtained by the Florida Center for Investigative Reporting." [Addendum: FEMA has announced that "Starting next year, the agency will approve disaster-preparedness funds only for states whose governors approve hazard-mitigation plans that address climate change." For a brief introduction to The Illuminati, The Bilderberg Group, the Trilateral Commission, the Skull & Bones Society, and Bohemian Grove, see The Paranoid's Guide to Secret Societies. A series of seven maps illustrates how Ukraine evolved into its present geographic arrangement. A wheelchair-bound 5-year-old girl scores a goal in ice hockey with the assistance of a Chicago Blackhawk. A set of photos of the New York apartment Lauren Bacall lived in for over 50 years. "Dairy farmers routinely feed their cows a finger-sized magnet, which settles in the digestive tract to help keep the cows healthy... To check if a cow already has a magnet, farmers use a compass." "Palcohol" is powdered alcohol. Proponents say there is no risk of people snorting it, that it's no easier to sneak into events than liquid alcohol, and that it's difficult to spike people's drinks with it. Video of a 95-year-old man setting the world record for the 200m sprint for his age group. "Hunting competitions" are quite popular. "Some $76,000 in prize money was at stake—more than $31,000 went to the team that bagged a 32 pound bobcat. Other jackpot winners were a four-man team that killed 63 foxes, a team that killed 8 bobcats, and another that killed 32 coyotes." The famous "Patterson film" of a walking "bigfoot" has been image-stabilized, and it's obvious to anyone viewing it that this is a man wearing a costume. 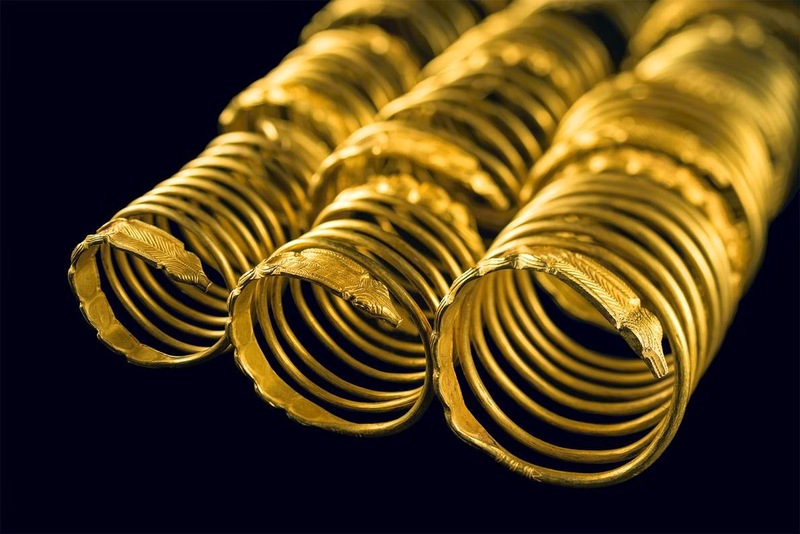 An article at Lapham's Quarterly explains how establishments that buy your old gold and silver routinely rip off the customers. Progressives who have mostly given up hope of getting Elizabeth Warren to run for president against Hillary Clinton are now pondering the possibility of Warren as a vice-president. "Warren would bring a populist appeal to the ticket that Clinton does not possess." Based on over 200,000 Jeopardy! questions used in the program, the most common Jeopardy! response is "What is China?" In Double Jeopardy, it is "What is Australia?" The most common category in Final Jeopardy! is "Word Origins." "The White House is removing a federal regulation that subjects its Office of Administration to the Freedom of Information Act, making official a policy under Presidents Bush and Obama to reject requests for records to that office." Members of a University of Michigan fraternity partying at a ski resort caused an estimated $400,000 of damage. "There was damage to 45 rooms, and students destroyed ceiling tiles and exit signs, broke furniture and doors and urinated on carpeting." A 26-minute video nicely explains the unique environmental features of the "driftless zone" in the Upper Midwest. Was the plane crash that killed UN Secretary General Dag Hammarskjold an assassination? Was it engineered by agents in the United States and Europe? The UN is reopening an investigation. Why is insulin so expensive in the United States. "Greene decided to call some local pharmacies, to ask about low-cost options. He was told no such options existed. 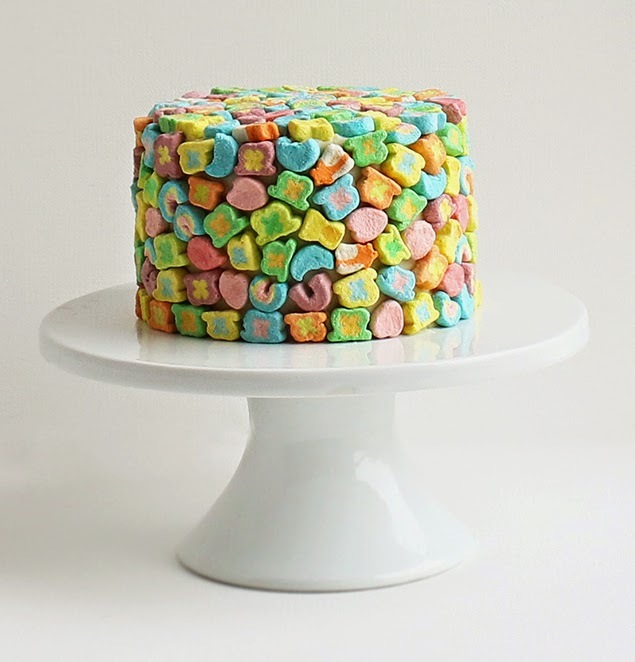 Only then did I realize there is no such thing as generic insulin in the United States in the year 2015," he says. Browse all 600 pages of the JC Penney 1982 Christmas catalogue. 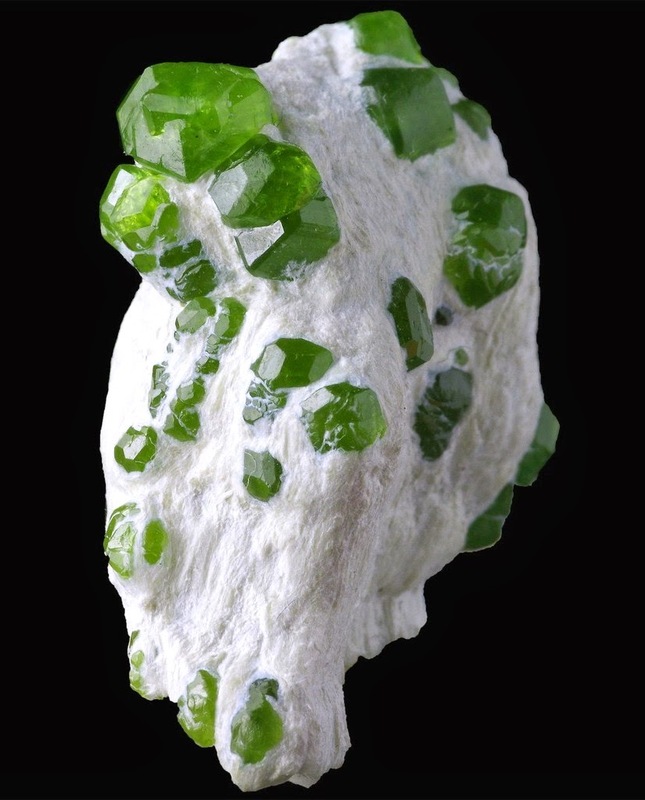 While garnets have been known since ancient times, the demantoid variety was not discovered until 1868 in Russia's western central Ural Mountains. From the time of the demantoids find until about 1919, they were popular in Russia as the famous Peter Carl Fabergé made jewelry with them. *I think I've finally come up with an appropriate title for this recurrent feature of the blog. I've never liked the term "linkdump," since it carries connotations of garbage. The best title - "I've Got Your Missing Links Right Here" - has already been claimed. I've tried using quotations, aphorisms, puns, opening or final sentences from books, and just calling the posts smörgåsbords. But earlier this week while listening to the radio I heard a piece by Mozart referred to as a "divertimento." Divertimento (from the Italian divertire "to amuse") is a musical genre, with most of its examples from the 18th century. The mood of the divertimento is most often lighthearted (as a result of being played at social functions) and it is generally composed for a small ensemble. Sounds about right as a description of this feature, although the number of links tends to be more orchestral in number rather than a small ensemble, and the mood is not always lighthearted. 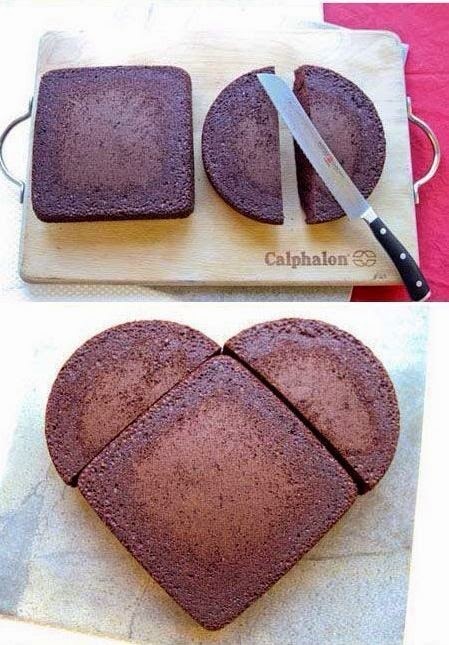 But it will do for now. 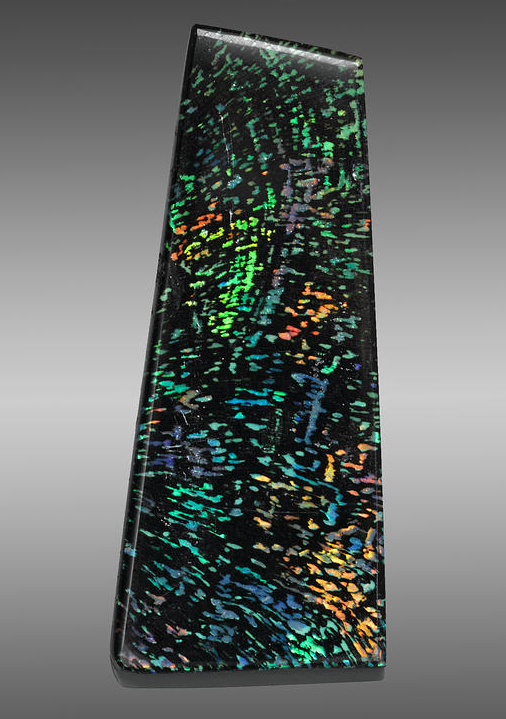 Rare American Opalized Wood “Conch Pattern” - Royal Peacock Mine, Virgin Valley, Nevada. Via the Minerals, Minerals, Minerals! tumblr. 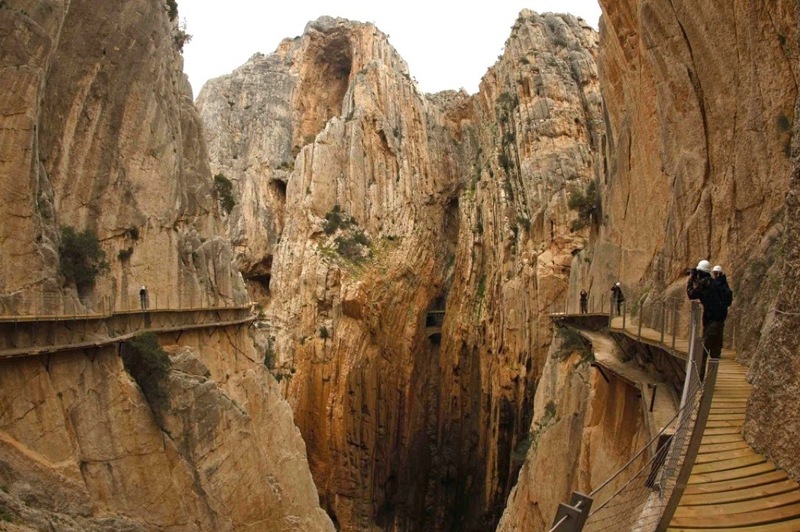 El Caminito del Rey - the world's scariest hiking trail. Updated. Intriguing and scenic, but I had to hold on to things just to watch the video. El Caminito del Rey (The King's pathway, often shortened to El Camino del Rey) is a walkway, now fallen into disrepair, pinned along the steep walls of a narrow gorge in El Chorro, near Alora in Spain. The walkway has now gone many years without maintenance, and is in a highly deteriorated and dangerous state. Some parts of the walkway have completely collapsed and have been replaced by a beam and a metallic wire on the wall. Many people have lost their lives on the walkway in recent years. After four people died in two accidents in 1999 and 2000, the local government closed the entrances. However, adventurous tourists still find their way into the walkway. (credit to Presurfer). Work began in March this year, with authorities hoping the new walkway will provide a boost for tourism in the area. The 1.2kilometre trail was originally installed to allow workers access to the Guadalhorce dam. Before and (concept) after photos at The Telegraph. This walkway is on my bucket list of things-I-never-want-to-do. Update: The Washington Post has a nice photogallery showing the updated walkway, which apparently was installed above, not in place of, the old one. I still don't intend to go, but now I feel safe in asking my cousin in Barcelona to go on my behalf. It was considered a collector’s item as early as 1882, when it was offered as part of the collection of Charles I. Bushnell Esq., a collector of Americana. It popped up eight years later, in 1890, and again in 1921. 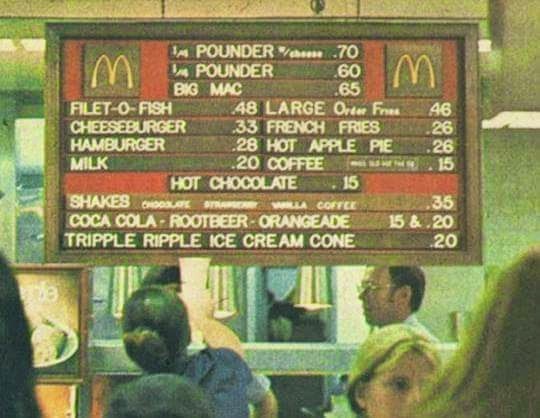 Four years after that, in 1925, it was advertised for sale for $1,000 (approximately $13,500 today, adjusted for inflation). While writing the title I wondered about the etymology of the term "pretty penny" as an indication of amount rather than beauty. It's not explained at Word Wizard; the Online Etymology Dictionary traces that usage to the 15th century and compares it to the modern phrase "pretty please as an emphatic plea." It's a small world. I forwarded the photo above to my brother-in-law in the TriCities area, who emailed back that the house involved belongs to a retired air-traffic-control colleague friend of his. "The first reaction is, "My goodness,'" said homeowner Phil Rickman, who arrived shortly after the van plowed into his foyer. "My second reaction is, 'Is anyone hurt?' It was an accident. Accidents happen. 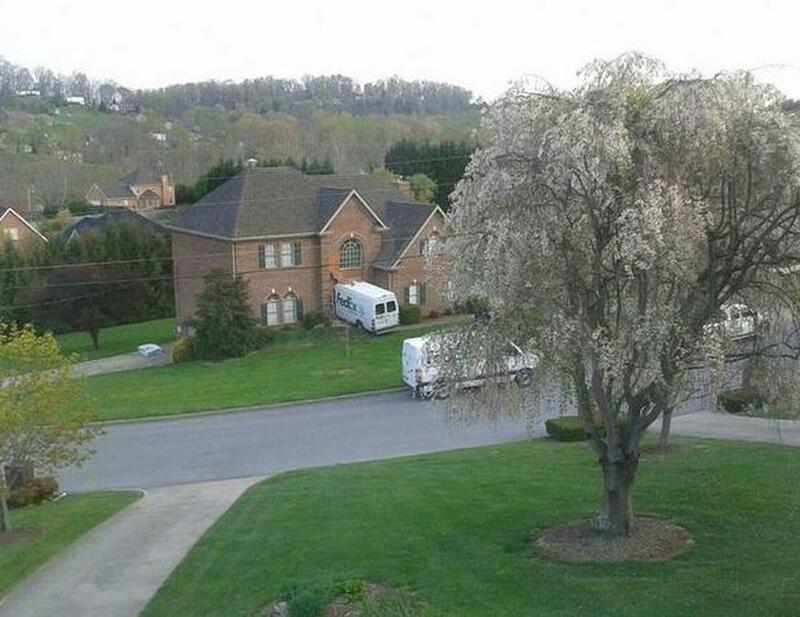 You have to keep everything in perspective." The chart above is for last night but there might be a carry-over effect to tonight. 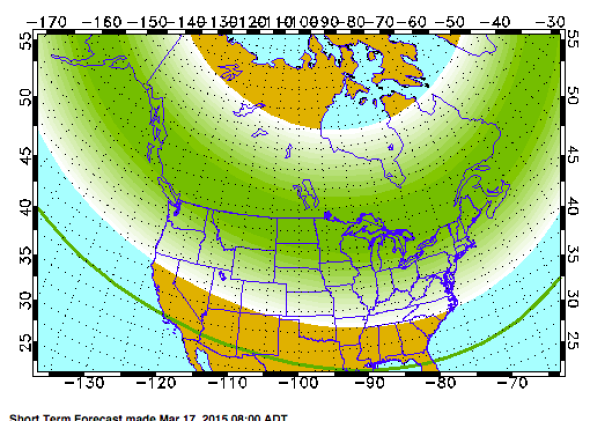 A St. Patrick’s Day solar storm will send a torrent of green-hued northern lights across much of the United States on Tuesday evening, as a fierce solar storm impacts the Earth’s upper atmosphere. If the storm holds up at its current strength for the rest of the evening, it could dazzle skywatchers as far south as Dallas and Atlanta, where it may appear low on the horizon. The dancing aurora borealis could be nearly overhead for Seattle, Chicago, and New York City. If it’s clear where you are, go outside. You won’t want to miss it. For real-time updated forecasts, see the 30-minute forecast at NOAA. White people are "expats." Others are "immigrants." What is an expat? And who is an expat? According to Wikipedia, “an expatriate (often shortened to expat) is a person temporarily or permanently residing in a country other than that of the person’s upbringing. The word comes from the Latin terms ex (‘out of’) and patria (‘country, fatherland’)”. More at the link, which is an op-ed piece and reflects the opinion of the author. I invite commentary from international readers of this blog as to whether the distinction hold in their country. 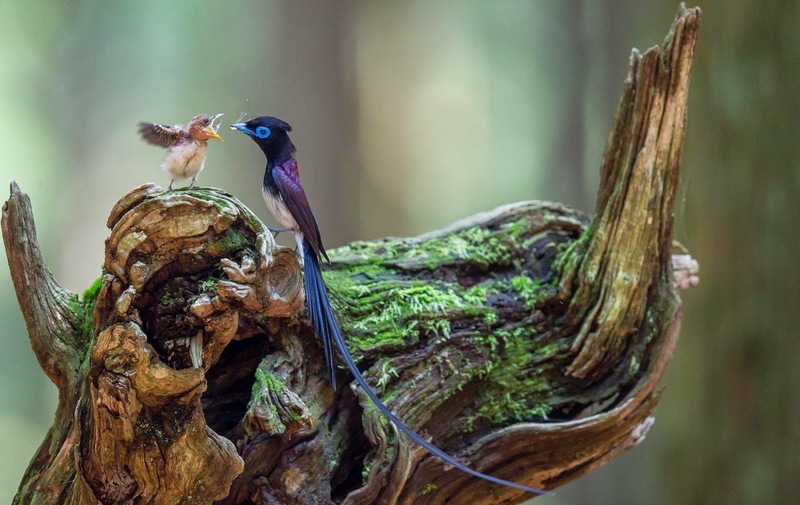 "A recent survey detected a steep decline in part of the Japanese breeding population which has presumably occurred because of forest loss and degradation in its winter range." 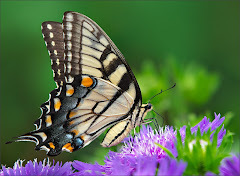 That seems to be true for everything beautiful and awesome in our natural world. Our grandchildren will have to be satisfied with jellyfish and cockroaches. "Her hair severely parted, Constanze Weber Mozart looks unsmilingly away from the camera. She appears to be staring at her feet. Next to her is Max Keller, a Swiss composer and old family friend, surrounded by his daughters and the rest of his family. In the background is a cottage with two garden-facing windows. 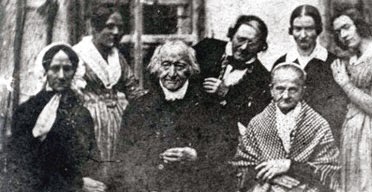 The newly discovered black and white image is the only photograph ever taken of Constanze Mozart, the widow of the Austrian composer and genius Wolfgang Amadeus Mozart. The previously unknown print was discovered in archives in the southern German town of Altötting, local authorities said on Friday, and has now been authenticated as including Mrs. Mozart, on the far left. ...it is claimed that the image was taken with a short exposure that, for technical reasons, was not yet possible in 1840. Selby (1999) states that there is no evidence in any of Constanze's extensive diaries and letters that she had contact with Keller after 1826, and that she could not have traveled to visit Maximillian Keller during the period when the photograph was taken, as she suffered from crippling arthritis at the time. 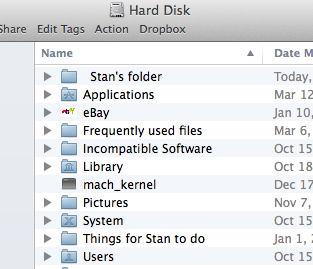 Yesterday, after permitting some recommended autoupdates to be installed on my Mac, two new items appeared on the menu of my hard disk. One was a folder for "incompatible software" (empty, and dated 6 months ago, but never present at this level of my hierarchical menu). I think this has appeared before after updates when the system replaces old components, but it's usually deeper down in the files. 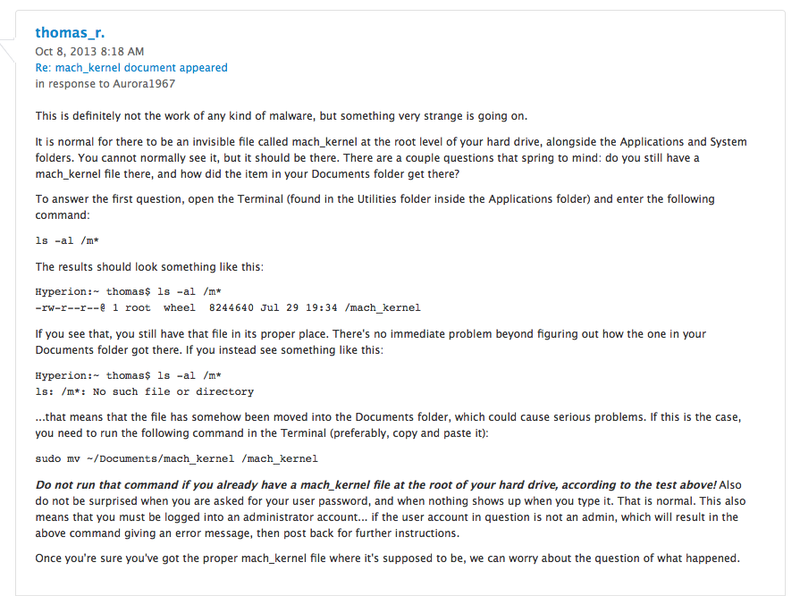 The comment comes from a trustworthy Apple Support Community webpage. I did type the requested command into terminal and received the favorable response of (?another) mach_kernel being in its proper place. I'm tempted to delete this new one, but reluctant to do so. 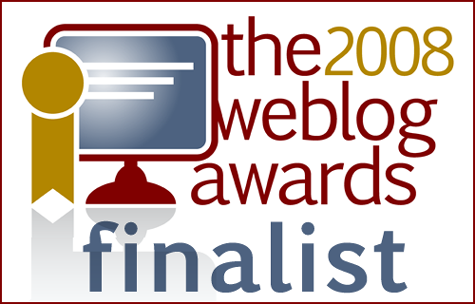 I may have to defer blogging for a while until I get the details of this worked out. FWIW, I've also found that I cannot now change the names of any of the folders in the image at the top without receiving a notice that "Finder wants to make changes" and then I have to type in my password. That has never happened before, and it doesn't seem to be happening with other folders located deeper in the hierarchy. Have any readers encountered this problem and dealt with it successfully? 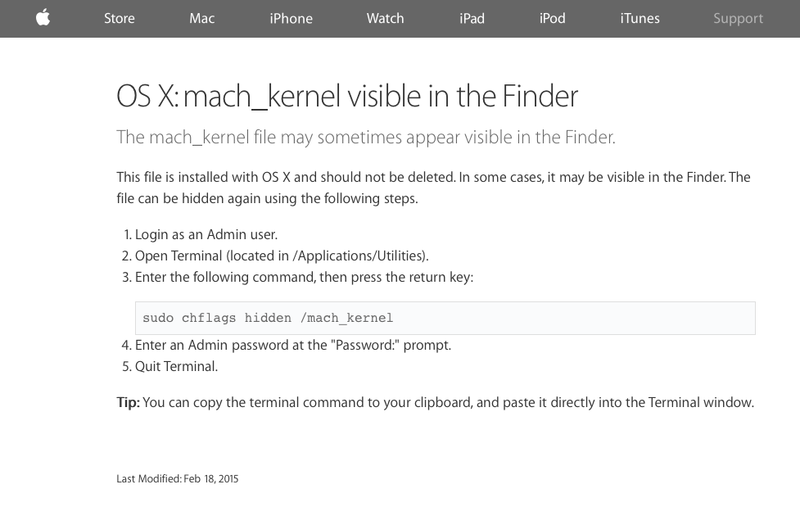 - but I don't know whether to follow that advice since Terminal tells me I already have a mach_kernet elsewhere on the computer. If I "hide" this new one, will it conflict with the other one? Rep. Gwen Graham (D-Fla.) introduced legislation Tuesday that would prevent members of Congress from using taxpayer funds on first-class plane tickets. The bill would also ban lawmakers from using government funds for long-term car leases for personal use. "It's a commonsense idea that Republicans and Democrats can both agree on: members of Congress shouldn't be able to charge taxpayers for first-class airfare or long-term personal car leases," said Graham, who will likely be one of the most vulnerable House Democrats in the next election cycle. I cannot conceive of any "commonsense idea that Republicans and Democrats can both agree on," but I wish her the best of luck in pushing this legislation. "It's the beekeepers dream, turn a tap right on your beehive and watch pure fresh honey flow right out of your Flow™ hive and into your Jar! 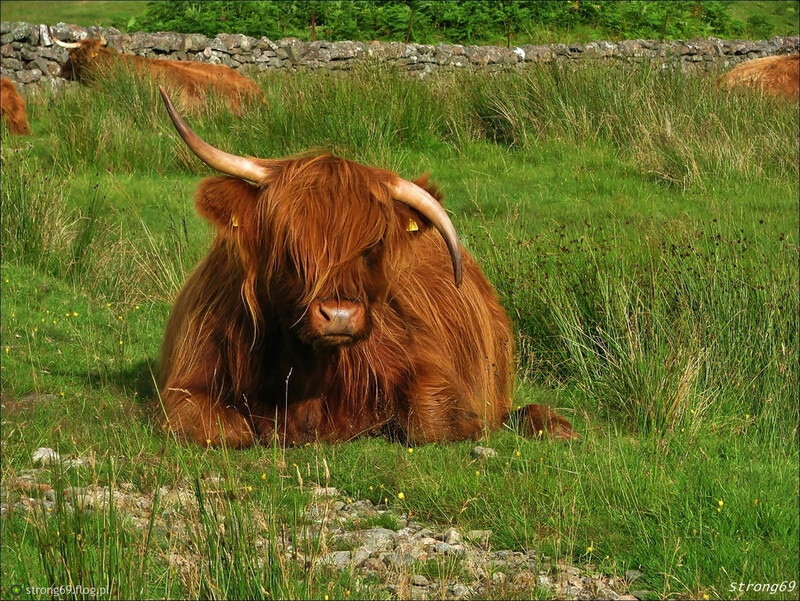 No mess no fuss and the bees are hardly disturbed." "This map produced by NOAA shows the land-surface temperature anomaly: how the temperature deviated from normal, on average, over the month. 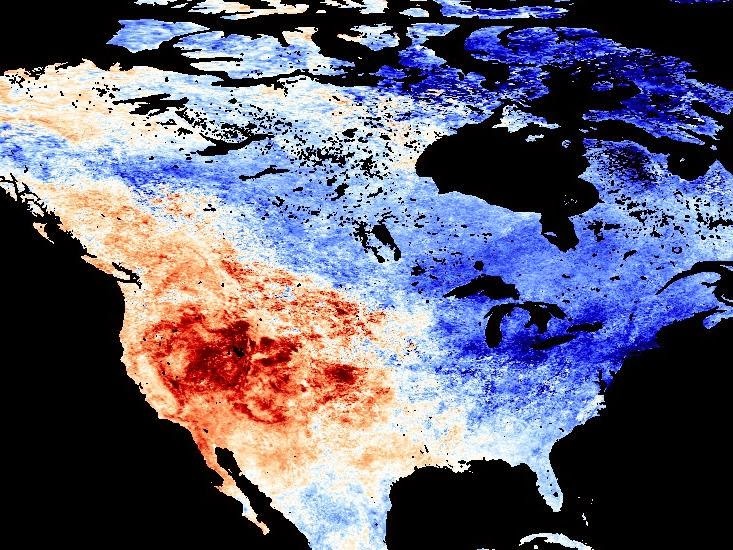 The darkest red areas were 12 degrees Celsius (22 degrees Fahrenheit) above average, while the darkest blue areas were 12 degrees Celsius below average." The jet stream is generated by a combination of Earth’s rotation and the flow of air down atmospheric gradients between high-pressure, mid-latitude warmth and low-pressure Arctic cold. Over the last several decades, the Arctic has warmed faster than any other region; during periods of especially heightened warming, as occurs when melting sea ice exposes dark, sunlight-absorbing waters, the north-to-south temperature difference shrinks. The pressure differences flatten. A coloboma (from the Greek koloboma, meaning defect,) is a hole in one of the structures of the eye, such as the iris, retina, choroid, or optic disc. The hole is present from birth and can be caused when a gap called the choroid fissure, which is present during early stages of prenatal development, fails to close up completely before a child is born. The classical description in medical literature is of a key-hole shaped defect. 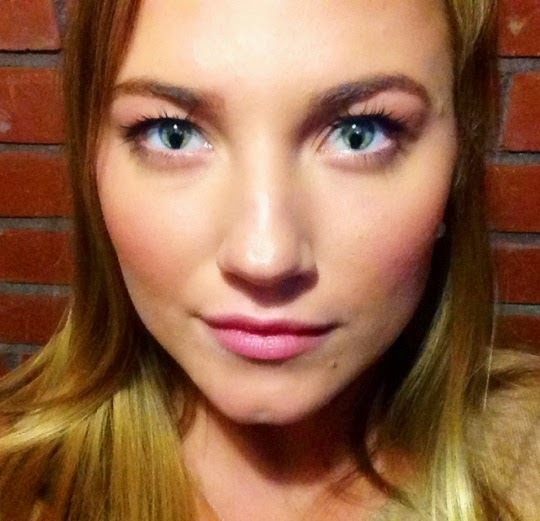 A coloboma can occur in one eye (unilateral) or both eyes (bilateral). Most cases of coloboma affect only the iris. People with coloboma may have no vision problems or may be blind, depending on severity. It affects less than one in every 10,000 births. One manifestation of colobomas is as part of the Cat eye syndrome, "caused by the short arm (p) and a small section of the long arm (q) of human chromosome 22 being present three (trisomic) or four times (tetrasomic) instead of the usual two times." Credit to mudge at Neatorama. 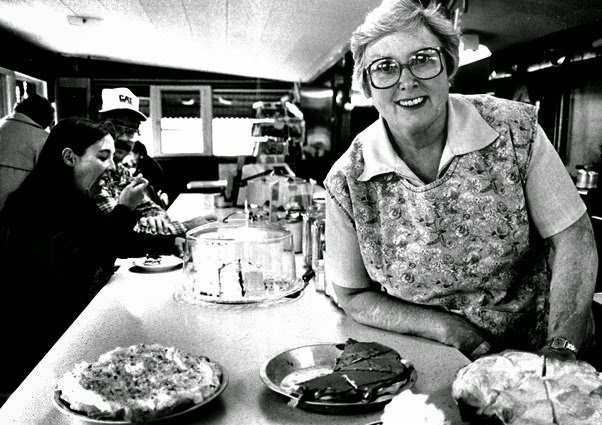 The meat raffle: a quintessential Minnesotan bar tradition that plays out every night of the week in one working-class neighborhood’s watering hole or another. Though its origins are unknown, its existence is as homegrown as tater tot hot dish. 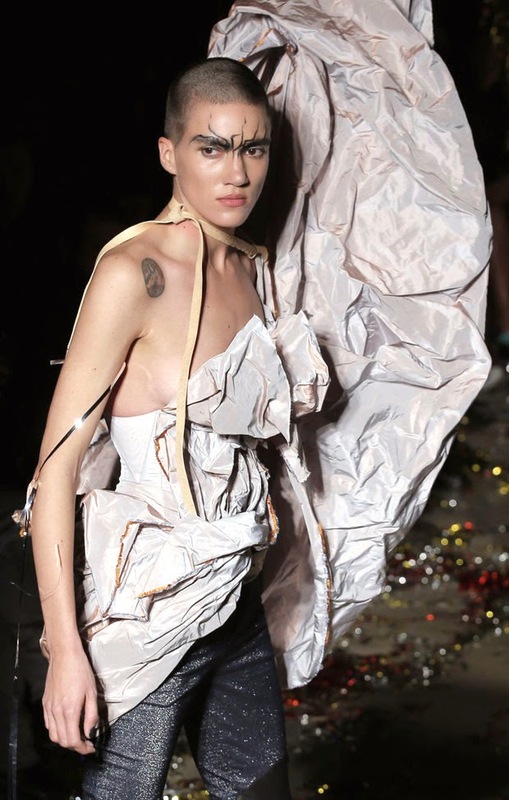 Buy a ticket for a dollar — the proceeds go to charity — and get a chance to win a shrink-wrapped packet of raw, pink flesh from a table at the back of the bar. Grumpy’s Northeast has spun the meat raffle on its head by merging it with another popular bar game. 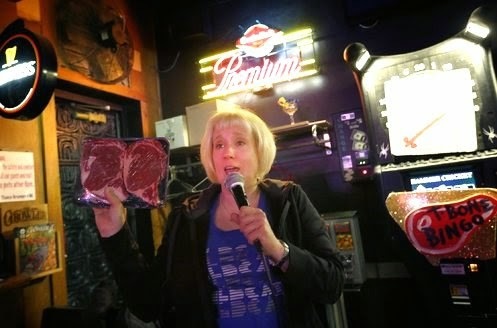 Instead of cash or gift cards, at T-Bone Bingo winners get — you guessed it — T-bone steaks. More details and stories at the link. - a la congenital hypertrichosis. 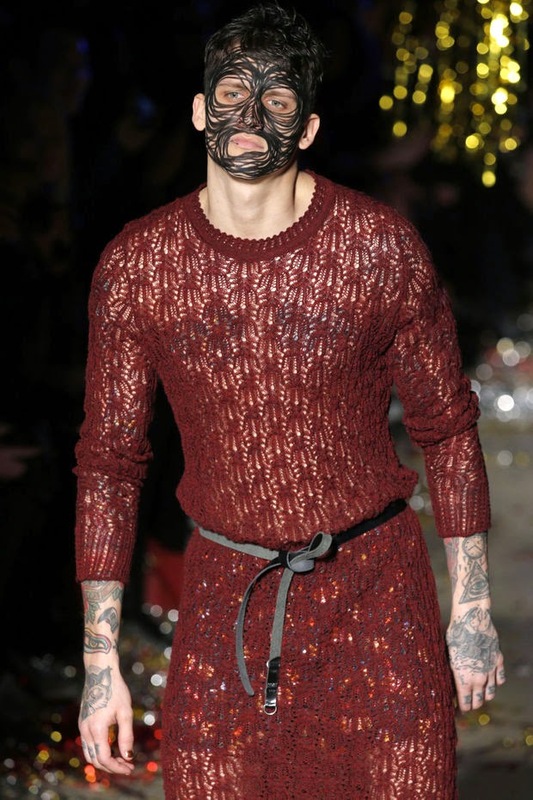 Personally I would favor gluing on a facial hairpiece, because this linear application to me suggests the aftermath of binge drinking at a fraternity where there is a large supply of magic markers. - might be awkward at the dinner table or riding the bus, but it does nicely accentuate the sideboob. There are dozens more images in a gallery at Madison.com. Argyroneta aquatica, is the only species of spider known to live entirely under water... found in northern and central Europe and northern Asia... Females build underwater "diving bell" webs which they fill with air and use for digesting prey, molting, mating and raising offspring. They live almost entirely within the bells, darting out to catch prey animals that touch the bell or the silk threads that anchor it. The replenishment of air is unnecessary in well-oxygenated water, because the bell permits gas exchange with the surrounding water; there is net diffusion of oxygen into the bell and net diffusion of carbon dioxide out. This process is driven by differences in partial pressure. The production of carbon dioxide and use of oxygen by the spider maintains the concentration gradient, required for diffusion.